NASA released this graphic for its Commercial Crew Transportation Program. SpaceX's Dragon capsule is one step closer to flying astronauts to and from the International Space Station. SpaceX has passed NASA's "certification baseline review," which required the California-based company to outline exactly how it plans to ferry crews to and from the orbiting lab using the Dragon spacecraft and its Falcon 9 rocket under SpaceX's Commercial Crew Transportation Capability (CCtCap) contract with the space agency. "This milestone sets the pace for the rigorous work ahead as SpaceXmeets the certification requirements outlined in our contract," Kathryn Lueders, manager of NASA's Commercial Crew Program, said in a statement. "It is very exciting to see SpaceX's proposed path to certification, including a flight test phase and completion of the system development." 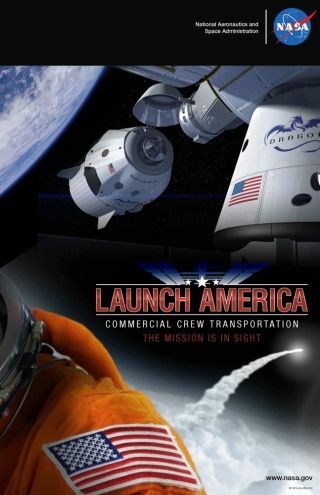 The Commercial Crew Program has been encouraging the development of private American spacecraft, with the aim of returning astronauts into space from U.S. soil by 2017 or so. NASA has relied on Russian Soyuz spacecraft to do this work since the space shuttle fleet was grounded in 2011. Relying on the private sector for access to low-Earth orbit should free NASA up to work on getting astronauts farther afield, such as to a near-Earth asteroid and Mars, agency officials have said. But SpaceX still has a lot of milestones to check off before Dragon and the Falcon 9 are ready to carry astronauts into space. While the CCtCap contract will culminate with at least one test flight with an astronaut in the spacecraft, the company is first expected to show how its operations, systems and materials will stand up to the rigors of space. Dragon is expected to last up to 210 days while docked to the International Space Station, providing an escape route if astronauts need to leave the orbiting complex quickly.